Yerba mate is a member of the holly family of plants that is widely distributed throughout South America. Although the herb has a very long history of use by the Guaraní and Tupi peoples of Paraguay and Brazil, yerba mate is relative newcomer to the rest of the world in the sense that it was only “discovered” in the late 19th century and didn’t gain wide popularity until the 1980s. While the herb has a variety of uses in its native regions, it is primarily used in tea blends and as a flavoring in liquors and other beverages. storage tips Store in a cool, dry place in a sealed container. appearance & aroma Leafy and green. culinary Yerba mate is prepared as tea alone or with other herbs and spices. Brew with herbal chocolate chai for a flavorful beverage. 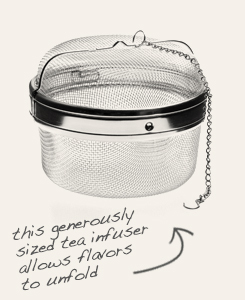 This generously sized infuser allows you to make the perfect pot of tea. Has robust flavor, similar to coffee. Yerba mate is considered the national beverage of several South American countries, including Brazil, Paraguay, Argentina and Uruguay. In fact, taking a break to refresh with yerba mate tea is as commonplace in these places as coffee drinking is to Americans. Yerba mate contains several active compounds that make the herb flavorful and nutritious. Like green and black tea, yerba mate contains antioxidant flavonoids, such as kaempferol, quercetin and rutin. The herb also provides calcium, iron, magnesium, manganese, phosphorus, potassium and selenium and vitamins A, C, E, B1, B2, B3 (niacin) and B complex. Background: Yerba maté is the caffeine-rich, South American native plant Ilex paraguariensis. 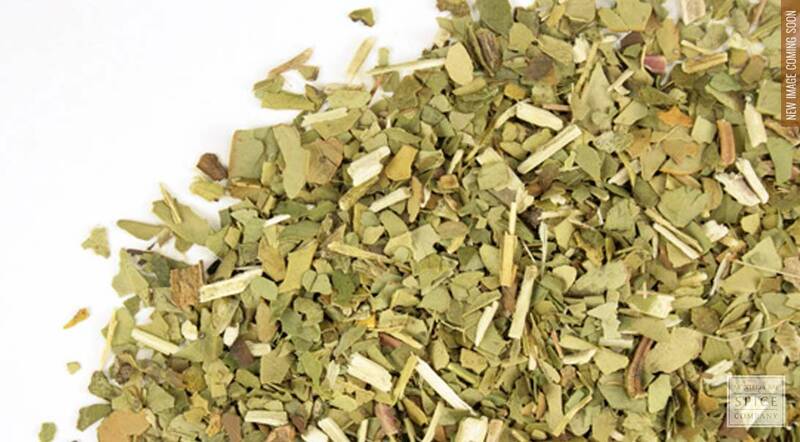 Infusions of Yerba mate tea are extremely popular for daily use throughout South America. Reportedly more than 90% of Argentinian adults consistently consuming it as their morning brew. There, Yerba maté tea is readily available at maté cafés and maté bars which are as prevalent as coffee houses are in North America and Europe. only obtained from the southermost parts of Brazil and Province de Misiones in northeastern Argentina. Description: The dioecious evergreen tree Ilex paraguariensis grows to 60 ft. in height. Leaves are alternate, coriaceous and obovate with a serrate margin and obtuse apex. The inflorescences are in corymboid fascicles, dichasiums of 3 to 11 flowers are male, female are of 1 to 3 flowers. Flowers are small, simple, numbering 4 to 5 with whitish corolla. The fruit is in a nucule; there are four or five single seed pyrenes (propagules). Maté blooms October to November), has entomophilous pollination (diptera, hymenoptera) and fruits from March to June; dissemination is endozoic (by birds). The rudimentary embryo in many externally ripe seeds cause a long germination. The genus Ilex belongs to the family Aquifoliaceae, which is widespread in subtropical and tropical regions of both hemispheres of the Americas. It comprises three genera in Argentina. Ilex paraguariensis is native to Argentina.